Most people prefer their history presented within familiar and readily discerned constraints. Certainly conflicts and overseas deployments, and hence the more broadly 'interesting' of military operations, can usually be pegged down with convenient dates and end-states. But this approach is far less conducive to understanding ongoing constabulary tasks, those that have been underway for many years and where no end is possible. Yet, while their results are often difficult to quantify, these tasks can be among the most vital in signalling that our national interests extend far beyond the coastal fringe. A case in point is the protection of our maritime borders and the huge estate within; a mission gaining much media attention of late and whose growing importance has been the impetus behind several recent government initiatives. Border protection is also a task that has, according to the most recent Defence Update, become far more difficult in the present strategic environment. Traditional threats such as people smuggling, attempts to import prohibited goods, illegal fishing, illegal trafficking in flora and fauna and environmental pollution, have been joined by a potent terrorist threat and the potential fallout from failing states. The latter are a significant concern because the insecurity they face can easily move beyond their borders. As an island nation Australia enjoys some natural protection, but as the Defence Update notes, it 'cannot be assured that our borders will remain inviolate'. Faced with this complex environment Australia has determined it needs a whole-of-government approach to deal with current challenges. The idea that maritime security threats require a multi-agency response is not new. 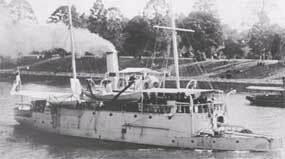 As far back as 1911, four out of the seven government departments then existing became involved when the Commonwealth Naval Forces (CNF) deployed the gunboat HMAS Gayundah on a constabulary operation to the remote northwest coast. Indeed, as one of the first such missions undertaken by the fledgling Australian Navy, the operation serves as a timely reminder that our political leadership has long relied on Australia's sea power for domestic law enforcement, particularly when seeking a credible and flexible means of policing our sovereignty at a distance. Acquired by the Queensland Government in 1885, Gayundah was thereafter actively employed on official service, providing a useful training platform for the Queensland Marine Defence Force and an effective demonstration of presence along the colony's 1500 mile coastline. Following Federation, Gayundah, together with all other units of the four former colonial navies, became part of the CNF. Until Parliament could create the necessary legislative and administrative machinery, however, the various forces continued to be controlled under Colonial Acts and regulations. Not until December 1904 did the Defence Minister appoint Captain (later Vice Admiral) WR Creswell as Director of Naval Forces. Still the best example of an Australian navalist, Creswell had long argued that the priority given to landward defences did little to satisfy the Commonwealth's desire to be accepted as an independent sovereign nation. Pointing out that Australia's seamen were the natural guardians of a maritime state he maintained that 'sea efficiency' was the 'first and most urgent call upon responsible authority'. As the CNF's professional head Creswell struggled to maintain the bare minimum of a seagoing force. Even after the 1909 decision to acquire the nucleus of a balanced Navy - the Fleet Unit - he could count on few additional resources. Nevertheless, by 1910 the idea that a Navy might be useful for more than warfighting had evidently taken root among other national agencies. Late that year the Minister for Trade and Customs, FG Tudor, asked the Defence Minister, Senator GF Pearce, whether a CNF warship could be found to make a 'special cruise' in northern waters. The novelty of this request needs highlighting. Australia's population, infrastructure and trade routes were all in the south, and few in power had ever needed to consider the security of the inhospitable and largely unknown northern coastline. But it was from the north that all threats must come, and here that foreign intruders already flouted the Federal government's authority. Pearce passed Tudor's request down to Creswell, whose responsibilities had yet to be defined in detail and who had to work within the limitations of the existing administrative and financial framework. The cost of sending a warship from the southern states would be too great, while Western Australia, whose waters were targeted for investigation, had nothing to offer as it had never developed its own maritime defences. This left only the vessels of the CNF-Queensland, of which Gayundah was the largest and appeared most suitable. Yet, while similar in size to today's Armidale class patrol boat, Gayundah was far less capable in terms of sustained patrol and distant response operations. Her top speed was only 10½ knots and her normal range 700 miles. Her readiness was also uncertain. The CNF had insufficient permanent personnel to keep Gayundah fully manned and lack of funds had restricted recent operations to short training cruises out of Brisbane. Creswell discussed the proposed cruise with her commander, Commander GAH Curtis. A survey confirmed the gunboat's seaworthiness, but essential repairs required at least £700, and shortages of skilled labour meant further delays. Not until February 1911 did Creswell task Curtis with providing his specific requirements in fuel, stores, provisions and men. To cover the expenditure in excess of the 1910-11 estimates, Treasury eventually provided just £1190. At the earliest date after being ready for sea, you will proceed to Port Darwin and Broome. Information having been received of gross irregularities continuing on the coast and islands included between above Ports, involving breaches of the Fisheries, Immigration and Customs Acts - of which you have been fully and confidentially informed - you will take such steps, as may be judged best, to carry out the instructions of the Customs Department. Curtis' authority came directly from the relevant sections of the legislation. Penalties for breaches ranged from heavy fines to forefeiture of vessel and cargo, and as an officer of His Majesty's forces he was entitled to 'seize any forfeited ship or goods upon land or water or any ship or goods which he has reasonable cause to believe are forefeited.' The limits of Commonwealth jurisdiction only extended for three miles from the shore, but should he find a foreign ship within this limit it 'must be brought to for boarding'. The Acts also provided appropriate rules of engagement, noting that a government vessel 'May chase any ship which does not bring to when lawfully signalled or required to do so and may (after having fired a gun as a signal) fire at or into such a ship to compel her to bring to.' Although a last resort, Curtis could be confident in judicial support for such action, as he 'or any person acting under his orders is relieved from any criminal or civil liability of any kind for any consequence of his act, even though his action result in loss of life'. Departing from Brisbane on 22 April, Gayundah coaled at Thurday Island and Darwin before sailing again on 13 May. Curtis searched several reefs and islands during his passage west, but saw nothing of note until reaching Scott Reef on 25 May. Here he found two Dutch schooners at anchor. When tide permitted, Gayundah's men boarded the vessels and discovered a quantity of trepang and trochus shell. Curtis informed the Dutch master that he was illegally fishing in territorial waters and, despite protests that Curtis was violating international law, he towed the vessels to Broome. To prevent escape and reinforce their status as seized vessels Curtis placed on each an officer and two men every night and during the day one signalman. Gayundah brought the two schooners into Broome on 29 May. They were handed over to civil authorities next day, but because her officers had to remain to give evidence at the subsequent court case Gayundah could not leave Broome until mid-July. The delay forced Creswell to seek an extension to the cruise, but permitted the Department of External Affairs to take an interest in the return passage. Additional tasking on Curtis included relocating a Federal scientific expedition from the Roper River to Thursday Island and intelligence surveys of some of the lesser-known bays and inlets. Creswell also gave Curtis liberty to take approriate action should he acquire at Darwin other evidence of evasion of Commonwealth laws. Specifically he was to obtain 'all information relative to communications with the [Far] East' by any foreign fishing fleets encountered. In effect, Creswell had begun establishing a system aimed at preventing threats to good order from developing into something more dangerous. It is a task that continues still, and has most recently evolved into the Australian Maritime Information System. Gayundah finally returned to Brisbane on 25 August 1911, and although making no futher arrests, all tasks were successfully completed. Presumably believing that they had received value for money, the Departments of External Affairs and Trade and Customs split the cost of the cruise equally between them. Creswell certainly thought the mission worthy of recognition. In writing to Pearce he noted that it had involved steaming 8000 miles and entailed almost continuous ocean work for over four months in a very small vessel. As this had called for strenuous service on the part of men used to far shorter voyages, and no allowances had been approved, Creswell suggested that each receive a gratuity of 14 days pay. The total amounted to less than £200, but the reply would have caused no surprise. While fully sensible of the good services rendered, the Minister regretted that could not see his way to approve 'monetary recognition'. Indeed, the only compensation received was by Gayundah's three officers, who successfully argued for 1/­a day entertainment expenses on the grounds that the great rarity of a warship visit to northern ports made this aspect a considerable burden. Gayundah continued to perform useful patrol service along the Queensland and northern coasts during World War I, and finally paid off in August 1918. Remaining in Brisbane she began a long career as a sand and gravel barge, and after 74 years afloat ended her days as a breakwater off Redcliffe. Today the RAN allocates at least 1800 patrol boat days to the national support task each year. Although just one of the stakeholders involved in maintaining the security of Australia's borders, as Gayundah's cruise demonstrated, it has a longstanding interest in protecting our offshore resources. More importantly, it still offers a unique contribution to surveillance and response activities while remaining the ultimate enforcer of our laws in the maritime environment. ↑ See for example: 'Strengthening Australia's Border Surveillance', PM's media release 1018, 28 July 2004; and 'Extra Armidale Boats to Boost Border Protection', Defence media release MIN 171/05, 15 October 2005. ↑ 'Australia's National Security: A Defence Update 2005', pp. 4, 10. ↑ Cited in GL Macandie, 'Genesis of the Royal Australian Navy', Government Printer, Sydney, 1949, p. 252. ↑ All subsequent quotations come from the SPC-A, HMAS Gayundah file. ↑ For details see Semaphore Issue 3, February 2006.